Written on February 15, 2006 by Kevin. My wife and I began purchasing the necessary baby items way before Rylan was born. The necessities included fun toys of course. There are many toys that parents seem to love as they were what kept them sane I imagine. Toys that provided the parents enough time to take a shower or brush their teeth. Rylan's toy as a newborn was one of his parents bouncing him. 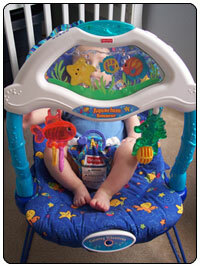 The Fisher Price Ocean Wonders Aquarium Bouncer was one of the purchases we made in hopes of giving us a place to put Rylan when a moment was needed to be taken for ourselves. This unfortunately was not meant to be. Rylan would just cry and fuss once he registered that we were about to put him in it. Luckily, those days are nearly gone. Now that Rylan is nearly 4 months old, he has certainly broadened his toy selection and seems to enjoy sitting in his bouncer now. The Aquarium Bouncer gives Rylan a safe place to rest as the vibrations run through his body. These vibrations are said to calm the baby like a car ride and for the most part, it really seems to help. The bouncer has a toy bar jam packed with all types of nifty things like moving fish and bubbles. The best part is that the toy bar is detachable giving easy access when putting Rylan in and pulling out. The bouncer should certainly grow with Rylan as it can be set for music that activates when he interacts with some of the toys, eventually teaching him cause and effect. For parents with young children, I would certainly recommend looking into this product. While I was a bit irritated that Rylan was not getting use out of a toy, I got over it when we were finally able to place him in it and he fell asleep. My advice is that you do not expect a child to play with any toy you purchase them and rather wish that they get use out of it someday. This should make life easier for ya.